This fabulous raspberry walnut torte cake will be an instant hit with your guests. It makes a fabulous birthday cake. We have made it many times; follow the directions carefully and it will be perfect. Store it in the refrigerator, but remove it about half an hour before serving so the texture is perfect. See the note at the bottom of the recipe for an easier version. Preheat oven to 350 F. Spray two 9" round cake pans with ​the nonstick baking spray containing flour; set aside. In a small bowl, combine flour, baking powder, salt, and ground walnuts. Stir well with wire whisk to mix. In a medium bowl, beat the whipping cream until stiff peaks form and set aside. In a large bowl, using same beaters, beat together sugar, vanilla, and eggs for 5 minutes at ​the highest speed, until light and fluffy. Then alternately fold dry ingredients and the whipped cream into the egg mixture. Begin and end with the flour mixture, and treat the batter very carefully. Pour the batter evenly into the prepared pans. Bake for 25 to 30 minutes or until top springs back when touched, and cake layers begin to pull away from edges of ​the pan. Cool the cake in the pans for 15 minutes, then remove layers from pans, and cool completely. For frosting, in a large bowl, combine cream cheese, butter, powdered sugar, 1/2 cup whipping cream, 1/8 tsp. salt and 2 tsp. vanilla until light and fluffy, scraping sides of bowl often. You may need to add a bit more powdered sugar or cream as needed to get a light and fluffy frosting consistency. Now split each layer of the cake in half. To do this, place toothpicks around each layer, sticking out around the edge, to mark the halfway point. Using a serrated knife, carefully cut the cake layers in half. You will then have four layers. Here´s a new trick we learned from Martha (you know who we mean!). To transfer the delicate layers, carefully slide a very thin cookie sheet, without edges, in between the cut layers. Then slide it onto the serving plate. Place the bottom half of one layer on the serving place and spread with 1 cup frosting. Top with top half of that cake layer and spread with 1/2 cup raspberry preserves. Repeat with third and four layers, topping with frosting and raspberry preserves, respectively, reassembling the layers back in their original form. Then frost the sides of the cake with the remaining frosting. If you like, you can pipe frosting in a decorative pattern on top of the preserves that top the cake. Store in refrigerator. Note: Okay, now that you are thoroughly threatened by this recipe, there is an easier way! Don´t cut the cake layers in half. 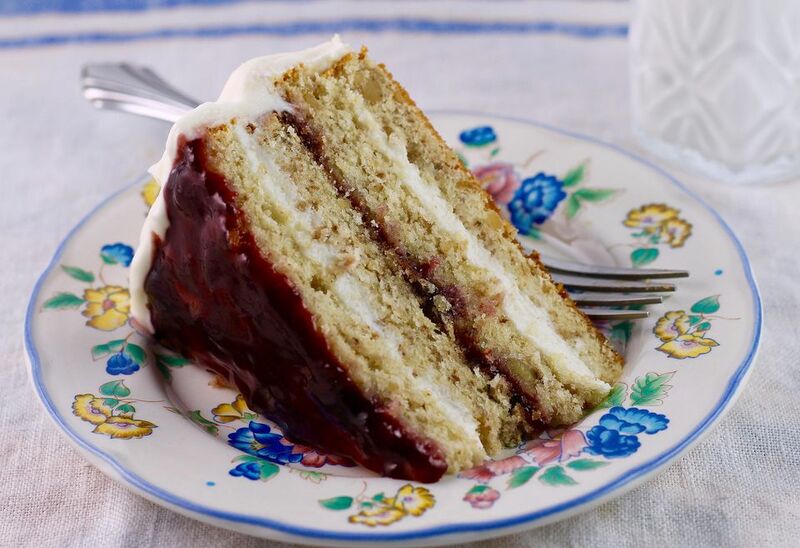 Simply put the two layers together with about 1/2 cup of raspberry preserves, then frost top and sides with the cream cheese frosting - pile it on. You'll still have a wonderful cake, with less work. Or, you can make a two-layer white cake using any white cake mix. Let the layers cool completely, then slice the layers in half and layer as directed, or simply fill and frost the two layers.